Bastian Schweinsteiger Salary, Net Worth: How Much Does Bayern Munich, Germany Midfielder Make? 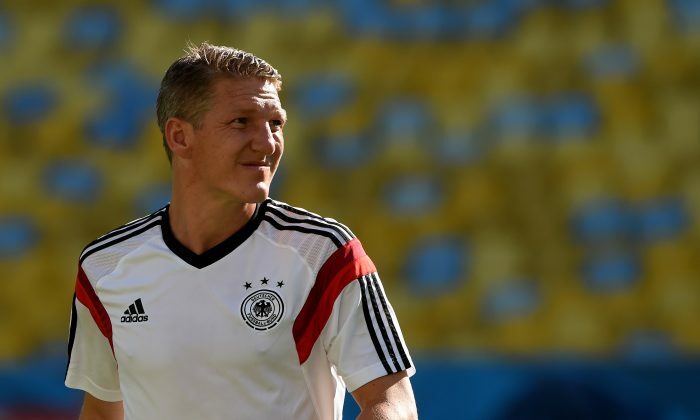 How much does Bastian Schweinsteiger make? The 29-year-old Bayern Munich midfielder began his senior career with the Bavarian giants in 2002. Schweinsteiger originally played on either the right or left wing in midfield, and was converted into a central midfielder in 2009 by then Bayern Munich manager Louis van Gaal. Since then, the gifted right footed player has been used by various Bayern coaches and in the German national side as a holding midfielder or a slightly advanced central midfielder. Schweinsteiger made a total of 473 appearances for Bayern, and scored 63 goals as of 2013/2014. According to CelebrityNetworth.com, Schweinsteiger earns $14 million annually, and has an estimated net worth of $50 million. PORTO SEGURO, Brazil (AP) — Facing criticism at home for failing to find the beautiful game, Germany is drawing parallels to its 1990 World Cup campaign, when it won the last of its three titles. Under coach Franz Beckenbauer in Italy, Germany got off to a rocket start, only to begin fading as the tournament grew long. But the Germans plodded through and beat Argentina 1-0 in the final in Rome to lift the title. In this World Cup, Germany crushed Portugal 4-0 to open the tournament but is under fire from fans and media for a perceived lack of flair, especially after needing extra time to beat Algeria 2-1 and earn a ninth straight spot in the quarterfinals. Germany plays France on Friday in Rio de Janeiro. Assistant coach Andreas Koepke recalled Wednesday how the team labored to win the 1990 title. Germany kicked off its 1990 campaign with a 4-1 victory over then highly touted Yugoslavia. It followed with a 5-1 demolition of the United Ararb Emirates but settled for a 1-1 draw with Colombia in the final group match. Germany then beat the Netherlands 2-1 in an ill-tempered match, and edged the Czech Republic 1-0 before needing penalties to defeat England in the semifinals following a 1-1 draw. Here in Brazil, Germany had to come from behind to earn a 2-2 draw with Ghana in its second match, before edging the United States 1-0 and struggling mightily in the extra-time win over Algeria that exposed its wobbly defense, which produced a series of errors in a shaky display. Germany had goalkeeper Manuel Neuer to thank for that win. “We are not happy either with our performances, but at the end we’ve always come out as deserved winners. It’s the winning that matters,” Neuer said Wednesday, ahead of the team’s departure for Rio de Janeiro. Germany coach Joachim Loew sounded a similar note after the Algeria match. Loew is under pressure to win his first title in his fourth major tournament. Germany was runner-up at the Euro 2008, a semifinalist at the 2010 World Cup and a semifinalist at the 2012 Euro, when his tactics in the loss to Italy were heavily criticized. Germany is trying to avoid the role of favorite in the match against France and knows it will have to improve. “France has always had good individuals but they now play as real team,” Koepke said.